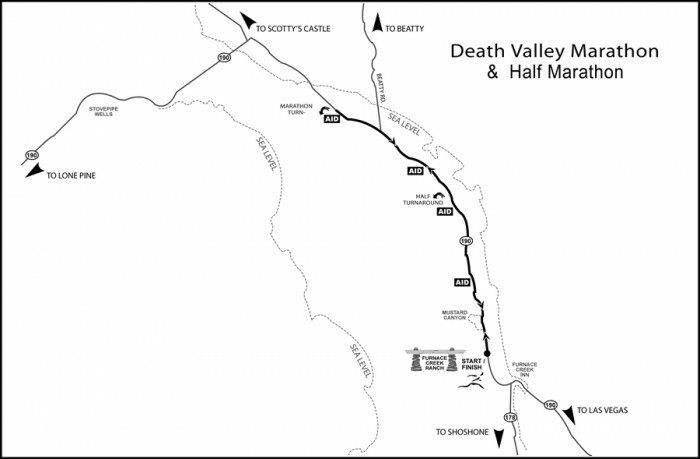 Death Valley Marathon, Half Marathon & 10K is SOLD OUT! Race day details online here. This event is limited and will sell out, so don't wait too long to register! CANCELLATIONS: Registrations are non-refundable and non-transferable. If you email us by January 6, you may receive a rollover credit (the amount you paid minus a $20 fee) to use toward any future Enviro-Sports race. HEADPHONES POLICY: Headphones/earbuds are NOT allowed as the road you are running on is NOT closed to car traffic. Discount room rates are available at the Furnace Creek Ranch & Inn from Thur 2/4/16 through Sun 2/7/16.